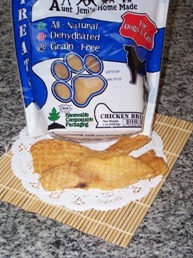 Through August 4th, you can save up to 12% on USA sourced,USA made chicken treats..
Dehydrated chicken feet 10 oz,made in USA. This treats comes in 10 oz bag with approx 20 feet in average. Dehydrating process removes moisture out from feet, and it makes dehydrated feet treats crumble rather than splinter sharp like when dogs chew cooked bone. 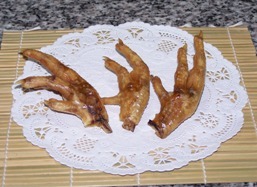 Poultry feet is great source of natural glucosamin/chondroitin and, good for joint. I give our dog “Palette” fresh poultry feet regularly, but when I ran out of fresh ones,I give this treats.Palette literally drool over my hands, anxiously wait for my release call. This is small nice snack for dogs as well. Due to natural products, each feet size can vary. Palette’s taste testing blog entry is here. Dehydrated Chicken breast 8 oz made in USA. 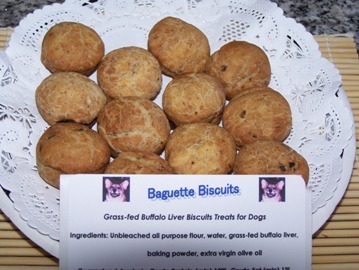 This treat is made from Bell and Evans brand Chicken breast.The chicken breast is thinly sliced and dehydrated.